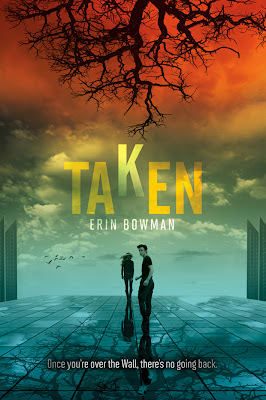 Author Erin Bowman has her debut TAKEN (formerly known as THE LAICOS PROJECT) coming out with HarperTeen in the first part of 2013. The summary makes me flail around with intense book desire. Gray Weathersby has spent the last seventeen years fearing his eighteenth birthday. In his isolated hometown, where dust outnumbers grass and crows rival clouds, all eighteen-year-old boys are lost to a phenomenon the villagers have come to call the Heist. After his older brother, Blaine, meets this mysterious fate, Gray's fascination with the Heist becomes an obsession. He craves answers. About the Wall that surrounds his town, a towering structure that no one can cross without dying. About the Council leaders and their obvious secrets. About the nature of the Heist itself. During his search for answers, Gray enlists the help of Emma, a healer's daughter and a girl he has admired since the day he first stole a wooden toy from her hands as a child. What they find leaves Gray with ideas. Dangerous ideas. Maybe Blaine hasn't been lost forever. Maybe Gray can find him. Maybe it's as simple as climbing the Wall and maybe, just maybe, Gray's fate won't be the same as everyone that has climbed before him. I believe people are drawn to "dark" stories because they recognize the evils that already exists in both their world and the people that populate it. Dark tales often take one (or several) of those evils and amplify them, letting the reader experience a "what if" scenario through the safety of pages, which has an obvious appeal. But above all, I think people enjoy these kinds of stories because they need to know that no matter how dark things become, in our world or in a fictional one, there is always a chance for change. They read to find the light -- the small snippets of good and hope and optimism that shine through an otherwise bleak tale. Truthfully, some of the most hopeful stories I've read are often also the darkest. There is something immensely satisfying about reading a tale where the characters have everything stacked against them -- their world is dark, dismal and unforgiving -- and yet they still manage to look inside themselves (and others), find the good, and fight back. If TAKEN had a theme song, what would it be and why? Acres / Visible horizon / Right where it starts and ends / When did we start the end? I guess I'd go with Four from Veronica Roth's DIVERGENT. Gray and Four have a lot in common. They are strong and determined, they see the strength in others, but I think Four has a sort of calm about him that Gray would appreciate. Gray is a bit more rash, often reacting instinctively before really reflecting on the possible consequences of his actions. Four could balance him out, and Gray has always needed a counter weight. Not all of these are the purest of dystopians, but they all have a dystopic air about them, and I fell in love with each one for different reasons. From the futuristic teenspeak to the advertising-centric feed embedded in the characters brains that cannot be shut off, this story is claustrophobic and a bit too close to home. Anderson writes this so convincingly that a leap from smartphone-in-hand to smartphone-in-brain seems realistic, extremely plausible, and not that far off. And the world building is spectacular. Everyone seems to love this book lately, and understandably so. Katniss is one of my favorite female heroines from recent reads. She is simultaneously weak and strong and I love her for that. And then there's the Capitol. The games. That mockingjay pin! Not only is this book a phenomenal post-apocalyptic/dystopian story, but I also found it to be a fascinating commentary on reality television. This was probably the first dystopia I ever read as a child, and perhaps it was why I fell in love with the genre. Discovering the truths of Jonas' world alongside him is both liberating and absolutely terrifying. Who knew a simple memory of snow could be so powerful? A classic, for obvious reasons, and another of my favorites. From Big Brother and the Party, to Newspeak and crimethought, this book has some of the best world building. You can feel the oppression and urgency as you read, making your journey just as emotional and heartbreaking as Winston's. I don't even now how to summarize this book other than to say I felt like a different person when I finished reading it, much like how the characters were different people by the story's close. Rosoff throws you into an ordinary weekend turned upside down by the outbreak of war. Plus the loose prose, rambling sentences, and lack of dialog tags is absolutely captivating. There are a lot of places I'd like to visit. Most of them are in Europe, but Harry Potter World is pretty high on the list as well. The apocalypse can not come before I have a pint of Butterbeer. I don't know if this is possible to answer without giving away some of my book's twists! (This is such a cop-out answer.) Hmm. Let me once again cheat by talking very top-level. The main character is a boy. The novel is written in first person present. I don't think there are many post-apocalyptic/dystopias out there right now with that combo. Dystopians centered on romance also seem to be pretty popular at the moment, and while there's a bit of love in my novel, the story focuses mainly on Gray's obsession with truth, with answers he has long searched for, and answers he may wish he never unearthed. Thanks Erin – you certainly have me intrigued. Why is 2013 so far away? Hey, there, mom of a boy and another boy on the way, here! I have to say a big Thanks on the male protagonist front. So...er...Thank, Erin! I'm so excited to read this, Erin! I'm loving the summary upon re-reads. And I love and agree with your answer about darkness -- it's the darkest stories that shine the brightest hope. I've never heard about this book before, but it sounds great. I'll definitely keep an eye out for it. Thanks for bringing it to my attention. This one sounds awesome! So much great dystopian on the way. You can tell by the way that she speaks and organizes her thoughts that she is a really talented wordsmith, which really makes me excited about the book. I have to admit that I am flailing right along with you, Lenore! This one sounds good! 2013 is so far away though!